A stick figure goes on a rampage in this slick looking and cheap shooter. 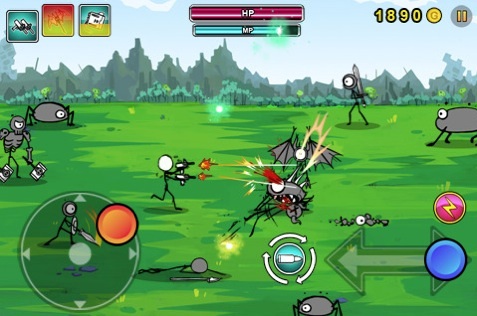 Cartoon Wars Gunner is a cute 2-D iPhone game starring a stick figure named Captain J. On the hunt for a corrupt king, the simply drawn hero vows to rip through whatever gets in his way using 11 different types of weapons, a list that includes a bow and arrow, pistol, bazooka, assault rifle and even a mech with two Gatling guns. It's a cool shooter with a fun role-playing twist, but the controls prevent it from being a masterpiece. Throughout the course of the adventure, the goal remains the same: kill anything that moves. There are 30 different types of enemies and they come in all shapes and sizes, from little dudes brandishing machetes to dragons and grizzly bears. They have a nasty habit of clogging the screen, so you must keep Captain J out of harm's way while unloading countless rounds in their direction. At first, you start off with the lowly bow and arrow (with unlimited ammo), and must accumulate gold to unlock the heavy artillery. This makes the game somewhat of a chore, only because it takes a little while before you can fire something cool. That annoyed us, especially during the harder levels, where we struggled to kill all of the monsters and then came to the disappointing realization that the game failed to reward us with tons of loot. That said, the slow slog makes acquiring a new weapon even more exciting, especially since it'll help you make short work of the horde. At the same time, some of the weapons overheat and need to cool off after extended use, so don't abuse them unless you want to fall back on the lowly bow and arrow. In addition, Captain J possesses Magic Points (MP) that let you cast spells, such as a rain of fire that incinerates nearby enemies. So here's where things get dicey. As much as we dig Cartoon Wars Gunner (especially at ninety-nine cents), its developers still need to work on the controls. The on-screen analog stick (used to move Captain J) isn't as responsive as in other games, and the firing buttons (arrows that make him shoot right or left) are a bit small and difficult to hit during the more frenzied moments. We also struggled changing positions to shoot creatures behind us, and in some cases, a fire button became stuck and Captain J wouldn't move, leading to some unfortunate deaths. Bottom line, BLUE GNC needs to release another update to fix this issue. As for presentation, although Captain J lacks detail, the rest of the game looks attractive, with colorful backgrounds (a grassy field, destroyed city) and cute enemies. There's also a cool effect where the characters grow smaller as they travel up the screen, suggesting they've moved further away, something we don't often see in 2-D games. On top of that, we dig the crackling gunfire and other sound effects. Not sure about the techno soundtrack, but it kind of works. Control issue aside, Cartoon Wars Gunner is a fun app with plenty of action, enough to keep you shooting for a few hours. Download and come out guns blazing. 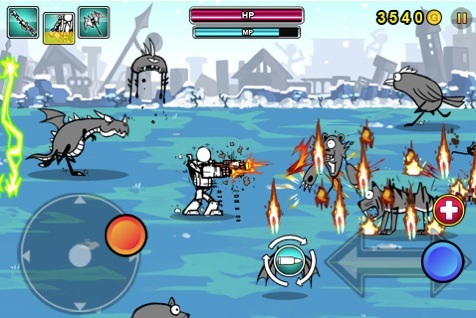 What's Hot: Simply designed but attractive graphics, 11 different weapons, 30 enemies, lots of levels, crisp sound effects. What's Not: Unresponsive controls, takes a while to unlock the cool weapons.